Forgetting what the aim is? Good point. My ultimate aim for this experiment is not simply to “own” the Google search phrase “Mac Poker Software”. My ultimate aim is to sell more copies of Poker Copilot. So far I’ve not detected any sales resulting from getting macpokersoftware.com onto the first page of Google’s results for “mac poker software”. Total traffic to the site is tiny. Does that mean it was wasted effort? Possibly. Possibly not. 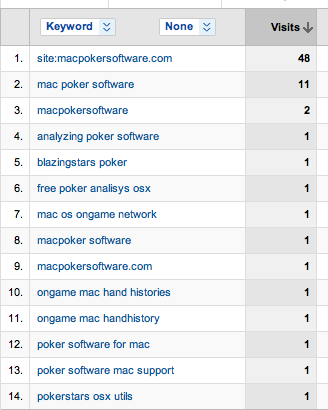 I’m still hoping to see macpokersoftware.com climb into the top three Google results as I continue to tweak the content. Allegedly, Google-driven traffic increases exponentially as a site move up the search results page. Almost every search query contains “mac” or “os x”.